On Decembe 27, 2013, Masaharu Tsubokura, a doctor from Tokyo Medical Institute and a team mamber of Prof. Hayano, disseminated a wrong information saying, "In Fukushima, I conducted a survey on internal radiation on 150,000 Fukushima residents and not a single person's health condition was subject to any concern." I happened to meet Dr. Tsubokura in person in Okinawa in 2011 and at that time, he agreed with my opinion and magazine artile saying, "I also read the paper by Dr. Bandazhevsky staing that heart abnormaly has been seen among residents whose cesium concentration is 10~20 Bq/kg"
However, 2 years later on TV, he stated that there was no health concern. Grave issues have been already emerging. In July 2013, a Siamese twins was born in Minamisoma, Fukushima, and died. It is strongly suspected that there was some radiation effects. Don't you all think pregnant women and children, and future reproductive generations should be relocated from Fukushima? 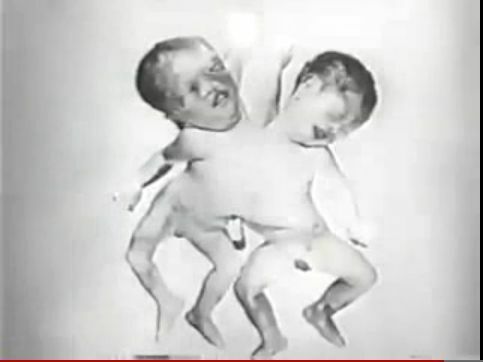 The above Siamese twin was born at 2km from the epicenter of Hiroshima. As of July 19, Tokyo Univ Prof. Masahiro Kami tweeted as follows; In spite of the feasibility of decontamination, I would like the idea of supporting those around the nuclear power plant to relocate. I think it is good to use tax money for it. (though in reality, maybe it will be difficult to assign the boundary, which could cause controversy for unfairness.) On the other hand, those who want to stay in their homeland should be able to stay. I think the each resident's view should be valued. Prof. Kami, please do make some action! Just tweeting would not save a single life of children! In Tokyo University Whole Body Counter Study, machine which can use for babies less than 2 year old was introduced, and in this coming September another machine for 0 year old baby will be introduced. That is an extraordinary story! I truly feel my spine chilled. If there was no contamination, there is no need to conduct WBC stury. In spite of that, if Japanese government and Toyo University spend money to develop baby WBC machines to use residents including babies ,who are most susceptible to radiation, to conduct live human experiments. This is an act which suffers the victims of the disaster in many ways, and eventually this could lead to the homicide of the weak! "Don't you think it is against humanity to conduct resarch of WBC examination on residents including children and pregnant women in contaminated ares?" "I would not be surprised if some radiation effects come out on children." Isn't this an act of abuse against children in Fukushima in a long timespan? "I cannot jump onto any conclusion, but I cannot deny the causal relationship." On May 27, 2013, there are as many as 27 thyroid cancer kids including the highly suspected ones. HOWEVER, THE ABOVE DOCTOR/PROFESSORS IN TOKYO UNIV ARE NOT TAKING ANY ACTIONS! The other day, along with other people（3 doctors, 1 scholar, and a Fukushima citizen）, we submitted the following to the Professor Hayano's thesis, but we haven't got any reply. 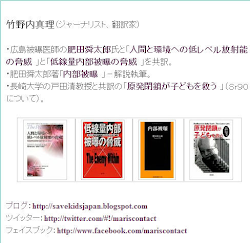 Prior to that, I put my comment on Dr. Tsubokura's blog, but I haven't got any reply yet. Long time no see. I met you in Naha in November 2011 and I gave you my article on Bandazhevsky. After that, I saw on your blog that even bodily cesium concentration of 10~20Bq/kg could cause abnormality in heart in your blog, and I was quite appreciative for it. However, in the JAMA paper, though more than 10~20Bq/kg were detected in many residents in Minamisoma, you declared the safty in the conclusion. I was greatly dissapointed on this. Was there any pressure from somewhere? Meanwhile you are harming the health and lives of residents in Fukushima, especially children. Are you aware of this? In the blog article, you mentioned that a resident was wearing a jacket equivalent to 3000 Bq. I think this was truly a grave fact and radiation exposure to this person's resparatory system should be considered first. In year 2000 or so, in Columbia University, it was proven that even one alpha particle could cause cancer. Have you ever read any paper regarding internal radiation and development of lung cancer? If so, please let me know the titles? Also, there are some unwanted rumors on Professor Masahiro Kami, your superior. They say that what he says in front and in the back are different. Some people in medical circle whisper that his acts are the same level as some kind of crimes. I also mentioned it in this blog. If you keep working for Professor Kami on the WBC research program, I am afraid that you could also be sued as a criminal. Dr. Tsubokura, please make a courageous decision and withdraw yourself from the research program, if possible along with Professor Kami. I do not want to see any scandal as in the time of HIV tainted blood product case where some experts and related people were arrested. Most of all, from a humanitarian point of standpoint, you had better withdraw from such research which may harm children and residents' health and lives. Please do consider this issue seriously.